In 2019, data continues to erupt as the commodity itself continues to fuel digital innovation. While it may seem this “data revolution” has been going on for the past 10 years, the reality is every year it is transforming into something new. The companies that are aware of this and are focused on keeping up, are the same ones economically benefiting from this data revolution. If you haven’t already had the chance to read the previous blog “Data has a better idea - the 5 stages of restaurant Business Intelligence”, I suggest checking it out to continue following our data journey storyline. Companies like Google not only gather data on the searches, but also the websites visited, videos watched, ads clicked, individual location, individual device information, and cookie data. Add up all those data points from one activity, and Google already has seven valuable insights into how to better optimize your experience. While it may seem like Google-sized companies are the only ones that can access insights from their massive collection of user data, the reality is new software has enabled smaller companies to organize and utilize their data in a similar way. 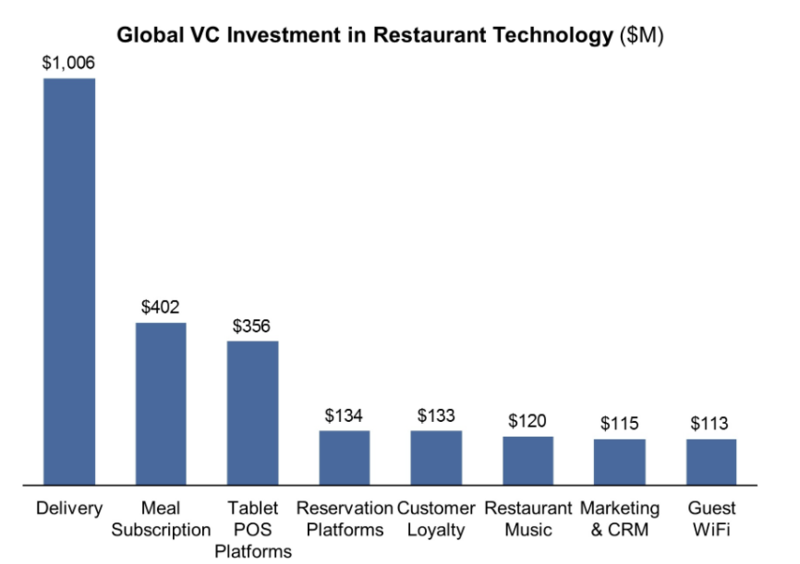 Before diving deeper into where SMBs collect data for valuable insights, let’s first take a look at how venture capital firms are choosing to allocate money in the restaurant technology space. As we can see, delivery, meal subscriptions, and tablet POS platforms are taking a large share of the global venture capital money. Not only do VC firms understand these technologies offer immediate value in their ability to increase business and simplify, but they also see the potential for massive amounts of data to be collected and utilized. In delivery & meal subscription, we see companies like UberEats and Blue Apron collecting data on an individuals location, willingness to spend, willingness to wait, and taste profiles. Using this data, these companies can better understand who their customers are in hopes of providing a better experience for both the restaurant and the eater. Tablet POS Platforms such as Square and Lightspeed are able to create similar results by providing tablets in which patrons can give feedback. This allows businesses to collect more customer experience data to improve the patron experience. Similarly, Reservation Platforms like VenueLytics are using AI to help venues in entertainment, food, and hospitality. By collecting data on customer loyalty, they are able to reduce operational costs, improve marketing ROI and increase revenue per guest. Finally, Guest Wifi companies like Purple, are leading the way in enhancing customer experience through providing complimentary wifi in venues of all sizes. With millions of people joining their wifi, companies are able to market, advertise, and track users activities. As one can imagine, there are countless technologies that SMBs can use to collect data. In order to get a closer look, let’s break down a few data channels restaurants and retail shops can use. So as any SMB owner can tell you, there is ample data to be collected, even if it is just a one location operation. If you don’t quite believe me, here is a snapshot of social media usage on a daily basis. 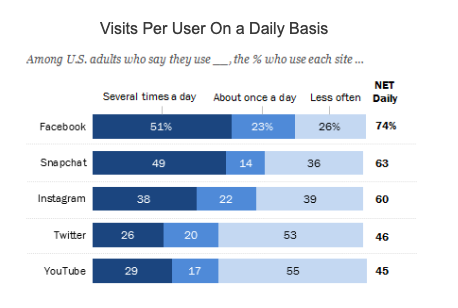 While it may not come as a surprise to most, the majority of people using Facebook, Snapchat, and Instagram are visiting the app more than once a day. These individuals are creating massive amounts of data through their interactions (i.e. scrolling, liking, posting, sharing, commenting, messaging, etc.). All of this social data can be relevant to restaurants as it tells you how people interact with your brand and how they make decisions. The value in analyzing this data is something we will explore further in our next blog, but for now, let’s take a look at what the future of data holds. As if data wasn’t already massive enough, the future for this field is only expanding. In this section, we will take a look at two new technologies that will increase the amount of data and examples of how they might appear in our everyday lives. The first example is IoT (Internet of Things), which refers to the concept of implementing internet connectivity beyond conventional computing platforms. This technology delivers vast amounts of real-time data: from sensors attached to machine parts, environment sensors, or even the words we shout at our smart speakers. Cisco calculates machine-to-machine connections that support IoT applications will account for about five percent of global IP traffic by 2021. SiteSage Smart Kitchen works to enhance food safety and overall kitchen operations by implementing self-installed sensors for refrigeration equipment, ovens, fryers, hot holding cabinets, ice machines, dish machines, and more equipment that can be managed and manipulated using your mobile device. In our next blog, we will explore data stacks for restaurants and the ways in which these businesses can absorb, analyze, and act using their data. Are you ready to continue your journey? You can count on Tenzo to help you kick-start your efforts and learn how to transform data into actionable insights. Let’s talk! Give us a call, send us an email or schedule a demo.